It’s the second day of the Playhouse Wine Festival here in Vancouver. Four days of wine tastings, seminars, and chatting with other people in the wine industry. Now only one year shy of its third decade anniversary, this year’s annual extravaganza features 1,550 wines from 180 wineries in 17 countries. It’s going to be a totally delicious, decadent challenge to keep up. We’re just back from a Riesling tasting – Riesling being the featured grape for the 2007 Festival. More complete notes will follow later, but here are a couple of decidedly non-vintage, though utterly intriguing, stories you probably won’t hear often. A spontaneous round of applause went to the speaker from Maximin Grunhauser for his enchanting, almost whimsical account of the business challenges faced by medieval monks who originally planted the estate in 966AD. At that time, each monk was given a daily allowance of wine as a form of “payment” for their work in the vineyard. Considered a fair price, each brother was entitled to three litres of wine a day. Only one full meal, but three litres of wine – 21st Century diet divas take note, there are wonderful things to be said about the nutritional values of wine. Then came a couple of years of bad harvest. Since large amounts of the monastery’s production often remained at home, the abbot of the day decided to reduce the allotment to a mere two litres per day. Monks began falling ill, languishing in their cells, and failing to attend prayers or mass. In despair, the abbot called in a physician who is reputed to have said, “Abbot, you may be a man of God, but you are not a man of business. You have to fill the cask or it will rot and the stomachs of the monk are no longer full, thus they are ailing from rotten stomachs.” The abbot in his wisdom, immediately increased the daily allowance back to three litres in order it should not rot the brothers’ insides, and soon the monks were, once again, filling the church with their prayers and their voices raised in song. Yes, god works in mysterious ways. 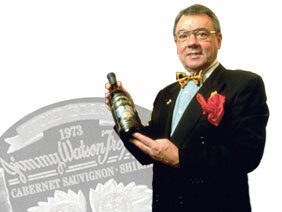 While most wine aficionados know Wolf, founder of the acclaimed Wolf Blass Winery, was born in East Germany, worked in the European wine industry for 13 years before immigrating to Australia’s Barossa Valley in 1961, and has long been considered a leader among the new generation of Australian winemakers, here’s lesser known peek at the face behind the label. According Scott (who’s last name we unfortunately both missed) tonight’s presenter from the winery, if you were to ask Wolf to name his three greatest passions in life, the answer would be: fast women, slow racehorses, and great Riesling. Okay, so we don’t get the slow race horses either, but we can certainly agree on the last comment. The taste of the Rieslings from France through Germany and Austria, across to North America, and right on over the ocean to the Land of Oz is still lingering on our taste buds. Here’s to the King of Grapes. This entry was posted in Playhouse Wine Festival, riesling and tagged Australia, Barossa Valley, East Germany, Food, Maximin Grünhauser, Riesling, United States, Wine. Bookmark the permalink.